I am participating in the Never Have I Ever Blog Tour This Week! “Monday through Friday this week, participating blogs will host a different game of NEVER HAVE I EVER, featuring three “Never Have I Ever…” statements from a different set of twins. 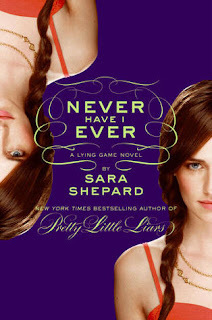 Readers must post a comment below correctly identifying the lie, as well as answer whether the Never Have I Ever statement from The Lying Game’s Emma and Sutton is true or false. Readers who successfully comment on each of the 5 blogs with all the right answers will be entered to win Sara Shepard’s books (all nine Pretty Litte Liars and the first two Lying Game books)! Never Have I Ever Blog Tour Schedule! Looking forward to it! I loved the first book in the series.